Zita lived in Brazil until the age of 20. From there, Zita moved to Paris where she studied the Art of Book binding, then moving to London’s KLC School of Design where she studied Interior Design. Inchbalds School of Design’s Garden Design saw the end of study for Zita and the beginning of her professional career. Zita ElzeFlowers Opened in Kew（near the famed botanical Kew Gardens）. At the world famous Chelsea Flower show, Zita received a Silver medal for her display. It was there that she introduced her signature technique "Floral Embroidery." The Zita ElzeDesign Academy was launched. Studentsfrom around the world attend to learn her philosophy and Floral Embroidery technique. Zita’s works continually receive regular attention in many mainstream magazines like ‘ Country Living’, ‘Wedding Flowers’, ‘Home & Garden’,etc. Ms Zita Elze’s‘Floral Embroidery’, a way of ‘painting with flowers’, is one of her signature techniques. Similar to Impressionist Paintings, Zita’s creations result in a three-dimensional model, likened to a painted flower. Also acknowledged for her Interior Design skills and Garden design, Zita brings her invigorating blend of unique meeting originality. 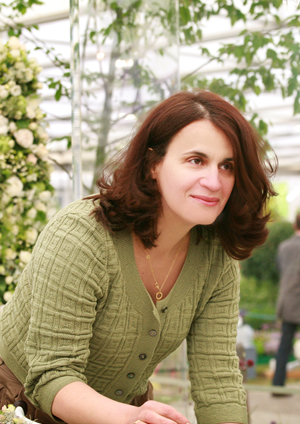 With her ‘Floral Embroidery’ obtaining her the Silver medal at The Chelsea Flower Show in 2009, Zita’s technique has blossomed into the diverse. She developed her Floral Embroidery from glass vases to fabric, and soon developed a range of exquisite Wedding Dresses, gowns and accessories for brides made entirely from fresh flowers, leaves and grasses. The end result is beautiful when fresh, but also after drying if the right techniques are applied. The "Living Embroidery Bridal Collection" was launched at the Chelsea Flower Show in 2010 and continued with two more gowns for the Designer Wedding Show where Zita is a regular exhibitor. “Painting with Flowers” refers to Zita’s intuitive style of very rapidly developing the design of a bouquet by swirling it around in her hands and checking on progress without stopping. “I would like to think that my style is very soft and pure and has a somewhat spiritual feel to it.” Says Zita. Working with design, more important than the design itself are the combination of color and texture. But Zita does not apply them to the design. Rather, she places more importance in the conceptand feeling, with her theme decided, and everything comes together. When asked what message she had for us, her response was ‘Break the rules’. This was her first lesson on her first day at Inchbald’s School of Design and she assures us that she has been doing so ever since. ‘Designs that are developed by applying rules tend to have a stale, “academic” feel to them – the secret of great design is to make the soul shine through.. Copyright 2019 FULL THROTTLES Co., Ltd.